This Etsy plugin installation and feed creation manual is an easy guide to list and start selling your products on Etsy. Go through these simple steps to create feeds and upload in Etsy. 1. Install & activate ExportFeed Etsy Plugin. To begin with feed creation process, you need to setup Etsy account first. 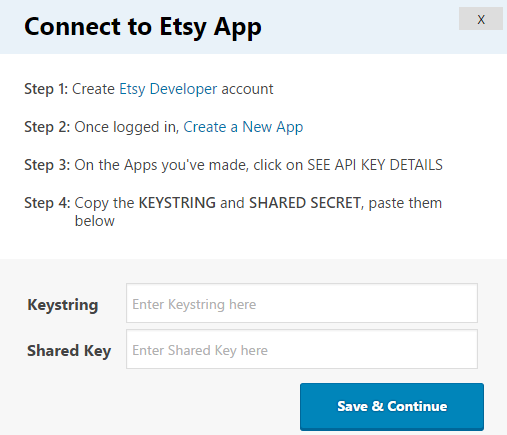 Follow the instructions to configure Etsy account and Etsy shop through the API details. Note * You must have Etsy developer account and an app to gather the information needed. Once you insert the Keystring and Shared Key, you need to “Save & Continue” to proceed with Etsy shop installation. Once your secret keys are saved, you’ll see this message on a dialog box. Select “Connect with Etsy” which will help you fetch login details and permit access to your Etsy shop. The configuration process begins with the “Request Login URL” step which should be completed as per the given instructions. 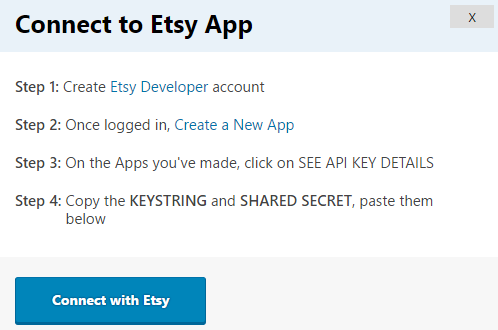 You’ll be redirected to Etsy shop as you Fetch the Login URL, click on “Allow Access” for connecting Etsy plugin with your Etsy developer account. Once, you select “Allow Access“, complete the procedure for installing your shop. You’ll receive the information below on the successful installation of Etsy shop. Insert the shipping details and initialize the default shipping for your shop. 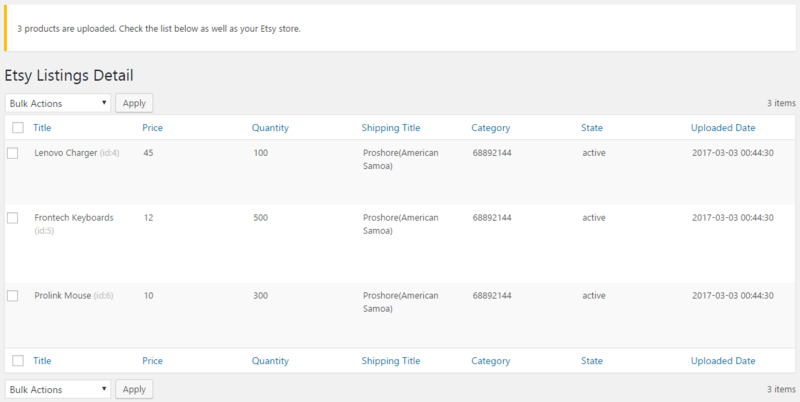 Now, you can create fixed shipping template from our plugin itself for etsy. Note: If you are new to selling on Etsy, please make sure that your Shipping Configuration on Etsy Marketplace should be complete. Without that, you will not be able to upload your products. Also, as Etsy API only allows the Flat shipping for bulk product updates, please make sure to create a Flat Rate Shipping Configuration. You’re now all set to create your first feed. On the “Create Feeds” tab, fill in Woocommerce category, Etsy category and file name for feed and click on “Get Feed“. Note: There might be error on your feed. Please check whether the required attributes are on the feed or not in order to list error free listings. Click here. Go to “Manage Feeds” section, select the feed and click on “Upload“. You can now see the details of the uploaded product. Looking to start selling on Amazon too?